I looked at my watch and learned that it was already 11.15 AM. My Boss had announced last week that the Auditors would be arriving today for a surprise InfoSec audit. So indirectly he wanted us to reach the office in time. I plugged in the headphone into my ears and started listening to random songs. I boarded the 11.21 AM Borivali local and stood near the gate of the compartment. The train was not crowded at this hour of the day. I got down at the Andheri station at platform number 1. I looked at my watch and it now displayed 11.32 AM. My eyes scanned the entire railway station and I witnessed something unusual today. There was a surprise visit by the Western Railway officials to get hold of ticketless travelers. 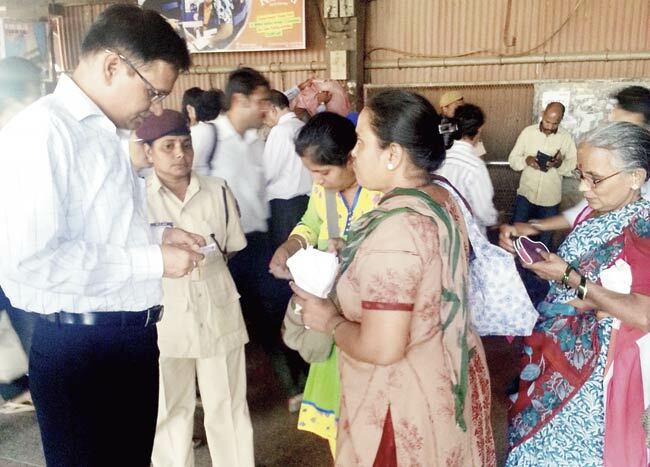 Andheri railway station was filled with Ticket Examiners on each and every platform. I checked my wallet for my railway pass. To my dismay, I couldn't locate it. I started sweating profusely. It seemed that I had left my wallet at home and it clearly implied that I was empty handed with no money to pay the fine amount. I decided to take the ultimate risk of my life. Travelling ticketless was against my principle. I walked towards the middle bridge. With music still blaring loudly into my ears, I took baby steps to reach the top. After reaching up, I could feel the adrenaline rush. At every entry to the platforms , there were a group of TC's examining the railway tickets and passes of passengers. TC's were stationed every where! I was quite sure that Western Railways was all set to execute its plan. And everything went well for them. I could see few college students requesting the TC's to leave them, they were literally pleading mercy. Few office goers were also caught red handed by few of the Ticket Checking officials. Some commuters hung their face in shame and remained speechless for a while. Few of the regulars who used this bridge were also caught. The Officers were clad in minister white shirts and black trousers. I could envision the scene as a video game, more kind of a Super Mario video game where Mario has to cross every single level to meet his princess. Well, for me the other side of the bridge was my princess! Seeing the things happening around me, I was surely destined to get embarrassed that too among people whom I never knew. I started building confidence. I took one step at a time. My lips curved into a smile every time I confronted a TC. Some of them even acknowledged me with a smile. As I crossed the Platform 1,2 barrier, a TC shouted, " Hey Mister!" I could feel over thousand butterflies fluttering inside my stomach. With anxious eyes, I turned behind and asked, "Me?" "Not you, that man,” the TC said, pointing his fingers towards a guy standing next to me. I moved ahead. Level 2 was easy for me. It was already crowded with ticketless travelers and the TC's were busy filling the fine receipt sheet. I slowly moved closer towards my destination. As I moved, a TC caught the man in front of me. He held him by his collar and took him towards the corner of the bridge. A lady TC stopped a beautiful college going teenage girl. I stood there for a moment and watched all that was happening. The girl requested the TC to let her go! The TC didn't budge. She stood there and asked her to pay the fine. But poor thing had forgotten her wallet too! She asked her to call her dad and pay the fine. If I had my wallet, I would have surely paid the fine amount for her. Well that could have triggered something good for me. Now everything was working as per my plan. I crossed the last level - Platform 5,6. I was feeling very excited. I ceremoniously walked towards the stairs to get down. It was something I didn't expect. I couldn't contain my happiness as I was not used to all this. It was the first time in my life that I was travelling ticketless and I escaped the cautious eyes of the TC's. I was feeling jubilant. As I walked , someone held their hand on my shoulder. I stood there for a moment. "Where are you running?" the person said. As I turned behind, I was stunned. I stood there speechless. It was one of the TC. I started sweating profusely. "You can't leave this station just like that," he continued. I didn't know how to react. My celebrations came to a sudden halt. "I..I ...I don't know what you are talking about," I said. Tears welled in my eyes. Now I could feel my heartbeats racing like a formula one car. I wiped the sweat from my forehead with my hand. "Is this your handkerchief?" he politely asked me. "Oh yes," I said and collected it from him. That actually wasn't my handkerchief. I threw it on a dustbin nearby and left the railway station. I started celebrating once again. "Mission Accomplished!" I thought to myself. I felt like performing a jig but that would have looked weird, so I tried to control my happiness. I hailed a taxi and asked him to go to Saki Naka. Sooner, I called my team mate and asked him to pay the taxi fare. Well, sometimes certain things happen when you don't expect it! A Quality Analyst by day and a dynamic blogger by night, Ste is an out-of-the-Box thinker whose thinking cap is never on the resting mode. The real feather on his thinking cap is his creativity which you can see in all his works, be it short stories, poems or sketches. He is a very big fan of Gabriel Garcia Marquez. Most of his short stories are inspired from real life and things that fascinates him. His blog "The Solitary Writer" is a central repository of his entire creative spear." .Did you like this post? Get The Solitary Writers updates via Facebook or Twitter, better yet, subscribe to it via RSS Feed. It’s easy, and free!Also you can discuss in the Forum. Comments are just another way to let me know how you feel.Don't forget to comment. Ahaaa... Travelling without a ticket and not getting caught !! Is this a real incident?? Breakups are usually accompanied by one of the celebrations obtaining it a new Relationship Advice. Becoming annoyed by the news of your ex lover starting the partnership using another individual is properly standard, and actually is great for the particular treatment method.